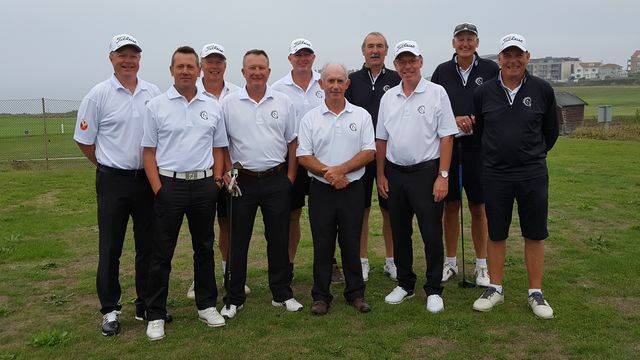 Wiltshire seniors stumble against Cornwall at Newquay. Well, the nightmare season continues!! Cornwall beat us 10.5 to 4.5. Oh…OK…I suppose you want more detail? Wiltshire did well in the morning by winning two matches, halving two and losing only one with all matches decided on the last hole: wins for Evans(Upavon)/Arthur(High Post), Warensjo(Marlborough)/Gubbin(Chippenham)…a winning debut for Gubbin (well done!) , halves for Dymoke(The Wiltshire)/Phillips(Kingsdown) and Dimond(The Wiltshire)/Cardno(Chippenham), and an unusual defeat for Bloomfield(Kingsdown)/Graham(Ogbourne). Foursomes score: 3-2 to Wiltshire. Then the rain came! But, to be fair, the weather didn’t make a lot of difference to the afternoon performances. It looked as though we were following in the footsteps of the recent England cricket test team…something of a batting collapse in the afternoon singles, with our early openers all failing to penetrate the Cornwall attack: Bloomfield, Evans and Dymoke all going down; the hint of a recovery when Graham (our number 4) rallied with a good half, but Phillips and Arthur went the way of our early starters. Then, another bright moment when Warensjo rallied to make another half for the team but an out of form Cardno (leading the team!) was out for what might be considered the equivalent of a ‘duck’; Gubbin lost on the last hole and Dimond finished the day with a half. NO WINS IN THE AFTERNOON! Yes, disappointing…but well done Cornwall. Newquay was a great venue, excellent greens with some parts of the course showing signs of the hot summer we have just had (the Cornwall captain suggested placing on fairways) but, with great views of Fistral Beach from everywhere on the course, it was typical Cornwall. The office, catering, green staff, the pro shop and the entire Cornwall team were excellent hosts over the two days we spent there...thanks, Newquay! Oh, and the breakfast we had at the Cliffdene Hotel was the best, and best value, we’ve had this year! One match to go: Glamorgan in October…and I just know, I know, I know, I know, there is a victory to be had at Bowood. Thanks to everyone in the team for your efforts and to everyone who has supported us so far during this season.